The periods for high season are: August 1 - 31 and December 15 - January 15. Single occupancy is possible with a supplement of 30%. Children under 2 years old are not accepted; children betweeen 2 and 12 enjoy a 30% reduction off regular rates. 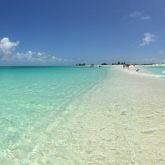 To confirm your reservation, after you receive confirmation of availability you will need to deposit 30% of the total cost of your stay plus the cost per person for the internal flight (check this page for current costs of the flights to Los Roques). The remaining balance can be paid in Euros or Dollars once you arrive in the posada. We don't accept credit cards. In case of cancellations prior to a month before your date of arrival, the deposit will be reimbursed completely. If the cancellation occurs within 30 to 15 days before your arrival - your deposit will not be returned but it can be reused within the following 12 months, depending on availability. Cancellations less than 15 days before date of arrival - the deposit will not be returned nor can it be reused for another stay.